We are happy to announce we now have 3 osprey chicks hatched. 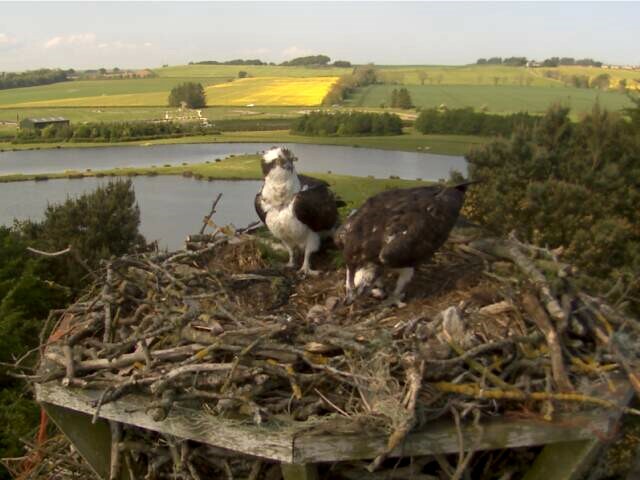 The nest which was erected 5 years ago has now successfully seen 4 broods of chicks hatch. The adult birds arrived back from Africa at the end of March and made quick work or tidying the nest and within a 3 weeks had laid an egg. On Monday the 26th of May the first chick hatched, with a second on the Tuesday and a third and final chick on Thursday morning. The chicks have been born in the most fantastic weather, giving them the best possible chance of survival. The Male osprey has been bringing in a plentiful supply of fish, varying from the rainbow trout caught here at Lochter to brown trout from the streams and rivers nearby. On Thursday there were 5 fish deliveries to the nest. The last 2 years have seen invasions on the nest from Buzzards which took one chick from the nest in 2012 and both chicks in 2013. Luckily, last year, the staff at Lochter managed to return one of the chicks to the nest which the buzzard found too heavy to carry. The nest and chicks are very vulnerable to invasion from buzzards and other predators which are populated in the area, especially while the chicks are at a young age. The nest at Lochter has a full HD 1080p nestcam feeding live images of the nest and the chicks directly into the restaurant. One visitor watching the chicks on the nestcam today quoted "This is the best reality TV I have ever seen!" The staff at Lochter and the many visitors are looking forward to keeping an eye on the progress of the chicks over the next few weeks. Click Here for a picture of the chicks, they are quite hard to spot as they are extremely small but hopefully over the next couple of weeks we will get a clearer picture to post. 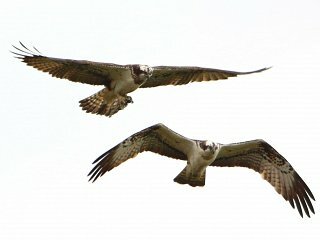 Do you have live streaming of your osprey nest on the internet? I’m afraid not, we do have live streaming of the nest in our restaurant though. The 3 chicks have grown so much over the past few weeks it is truly incredible! 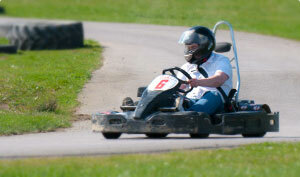 We are currently looking into this as we have had so much interest. Would be great for people who are able to come out to Lochter, who may live elsewhere to be able to keep up to date with the Osprey’s and their chicks progress.